Online accounting is a crowded market. Multiple players want a cut of growing revenues, expected to top $4.5 billion by 2019. In such a market there is room for both incumbents and challengers. 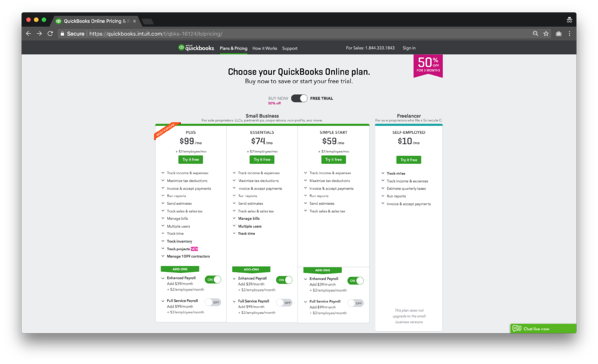 In the incumbent corner today on Pricing Page Teardown is Intuit's QuickBooks Online. The upstart is New Zealand-based Xero. QuickBooks Online (QBO) is the industry leader. 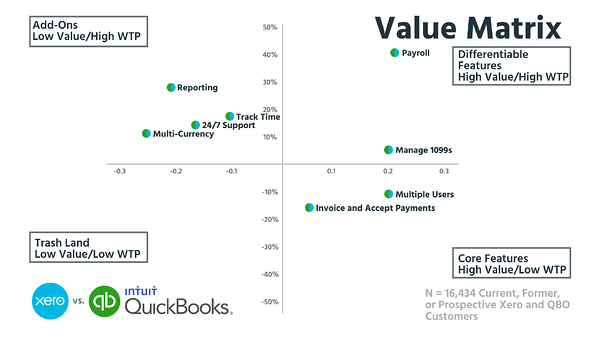 Intuit's combined revenue reaches beyond this market, to over $5 billion, with QBOs 1.5+ million subscribers contributing significantly to that success. Six-year-old Xero, is behind Intuit on revenue, hitting $302 million last year, but not far behind in market reach, with over 1 million subscribers. Watch this episode to see why both Peter and Patrick would choose to join the Xero masses than go for the QBO behemoth. Differentiation is two-fold for SaaS companies. 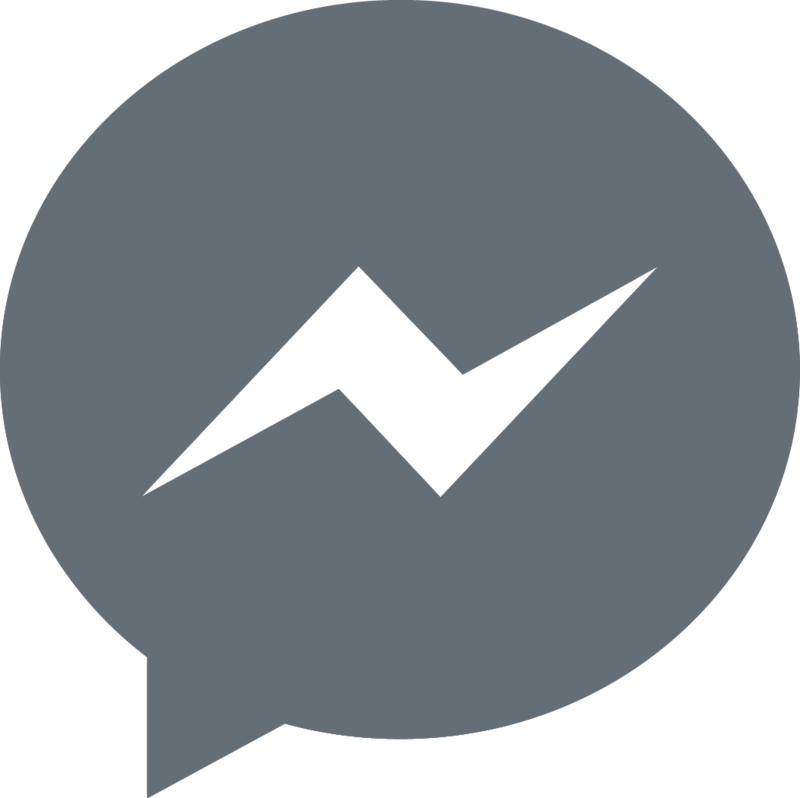 You have to differentiate your packages internally so that your prospective customers can choose the right plan and pricing for them. It is an important part of your pricing strategy. It is designed for the higher end of the market. Long feature lists and plenty of information for any accounting professional to make the right choice of plan. You also have to do plenty of math to figure out the right price for you, especially when choosing the “50% off for 3 months” option in lieu of a free trial. Here, payroll is in the top right of the top right, showing that it is ideal for a differentiating feature. This is how Xero handle payroll. The Starter plan doesn't run payroll, so people looking for just invoices and basic features have a plan for them. But once you are into the Standard and Premium plans, payroll becomes the main differentiating feature of choice. 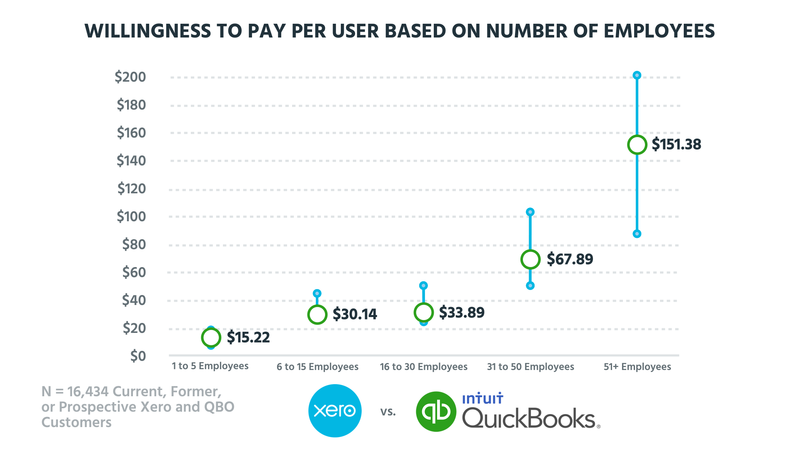 Instead, QBO treats payroll as an add-on. Add-ons should be features that few customers want, but those that do are willing to pay highly and that you can use for expansion revenue. For SaaS accounting, these are features such as reporting, time tracking, and multi-currency accounting. These are features that QBO are using as differentiators. It seems like they have their packaging backward. 70% of the market doesn't need to run payroll. Additionally, that role in the accounting ecosystem is now fulfilled by Gusto et al. and wrapped into full back office services such as Office Engine. 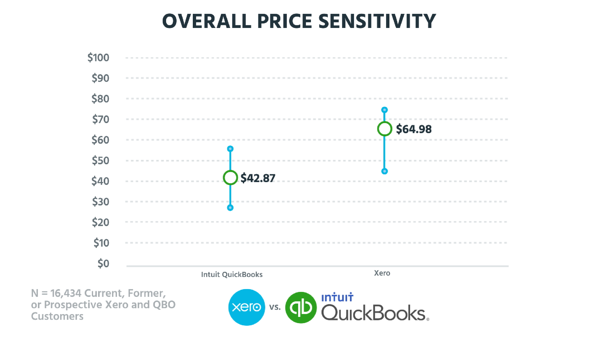 Xero may say they are a “...great fit for most small businesses,” but they aren't priced that way. They do have $9 and $30 plans which would fit into the lower segments here, but the $9 plan offers no payroll and the $30 plan only offers payroll for up to 5 employees. 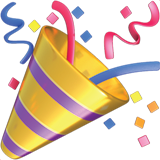 This means that customers at these lower tiers will have to add Gusto or another HR service to get all the features they need. Both are potentially missing out on the middle-range of customers. They could add another tier that better captures the needs of the 5 to 30 employee range of companies. 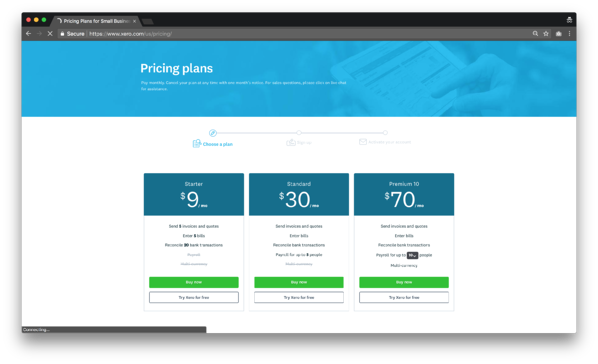 Xero also has the opportunity to go upmarket a little further, looking for a larger premium tier. At the moment, they segment their payroll options, with the largest option being 100 employees for $180/month. Our data show that this could a) be pushed up towards $200/month, or b) the cutoff for this option could be lowered to 50 employees. Both have a lower tier for all those sole proprietors. But both could increase the price of these plans by 50% to capture higher ARPU without harming acquisition. Both Patrick and Peter are clear: Xero has the greater momentum at the moment. QBO is the industry leader, but it is unclear where the product can go from here regarding growth. Xero still has a lot of growing to do. And because it appeals to a modern SaaS customer who wants clean design in their software and an obvious price and package to sign up for, it is the option with the greatest growth potential.